Dawnbreak, mostly destroyed, circa 2E 582. Dawnbreak is a little town located in northern Auridon, in a valley of southern Vafe, northwest of Skywatch, north of Shattered Grove and southeast of Firsthold. Dawnbreak is located in a valley of southern Vafe. The settlement has no walls or any other defensive structure and most of the town is built along the road between Skywatch and Firsthold. 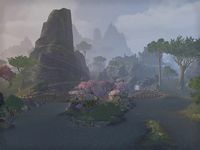 The surrounding nature is one of the most beautiful on Tamriel, where locals enjoy of its calm and magical atmosphere, where one can find lush and verdant hills, towering escarpments, and emerald woodland. The local Altmer prune and dig at their near surroundings in an effort to tame the rugged but beautiful countryside, being the paramount example the Isle of Comtemplation. However, much of southern Vafe is wild, and untouched forest shrouds almost forgotten Aldmeri ruins. It is unknown when Dawnbreak was exactly founded as an inland supply stop between Firsthold and Skywatch, no different than any other town in Auridon, coulding be as early as the Late Merethic Era, when both Firsthold and Skywatch were already High Kinlordships, to as late as the Second Era, when Dawnbreak was a well-stablished Altmer settlement. Queen Ayrenn was going to stop by in Dawnbreak on her way to Firsthold during her tour on Auridon in 2E 582. Preparations for the scheduled visit of Queen Ayrenn lasted for months, before it was cancelled due to a Daedric attack. They were mostly supervised by the Canonreeve's wife, Tenyemanwe, and included upkeep of homes and yards of the town and proper etiquette and dress of the citizens for the day of the event. 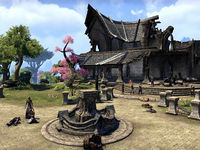 All citizens in the town was very excited about the outcoming visit of the Queen, even if some of them were still unwary of the newly formed alliances with both Bosmer and Khajiit and the rise of the Aldmeri Dominion. Tenyemanwe was one of the most loyal subjects to Queen Ayrenn in Dawnbreak, and tried to stop his husband to stay away from the Veiled Heritance and High Kinlady Estre, the Veiled Queen, unsuccessfully. Even before the destruction of the city, many citizens knew of their Canonreeve ties with the supremacist Veiled Heritance. 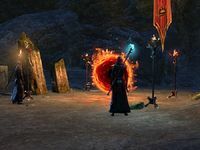 After her escape from Skywatch, Estre ordered the Canonreeve Sinyon to met her with the certain material, necessary for Daedra summoning, unbeknownst to him. Shortly after the Daedra summoned by Estre from the Deadlands began to attack the citizens of Dawnbreak and to burn it all, the First Auridon Marines organized an evacuation of the town and stopped the hordes from spreading until one Eye of the Queen came and defeated the Dremoras tasked by Estre to destroy the town down in the abandoned town's mine. The destruction of the strategically positioned Dawnbreak was nothing by an attempt to impede the pass of Queen Ayrenn and her troops to Firsthold, allowing the Maormer allies of the Veiled Heritance to roam freely around northern Auridon. Even with outside help, many Marines and locals died or get injured during the attack and most of the town turned uninhabitable, however, most of the citizens were safely evacuated out of the settlement and the road to Firsthold remained open from the South. After the city burnt down, it was also Tenyemanwe, instead of her husband, Canonreeve Sinyon, who leadered the beginning of the town's reconstruction, thought to take a long time and to be very laborious, giving the mass destruction. Sinyon was not charged of treason because of his repetance about his relationship with both Estre and her Veiled Heritance, even when his own wife blamed him for all the mess. Dawnbreak has been an integral part of the realm of the Summerset Isles since its foundation. A Canonreeve is tasked to rule the settlement, which has been bestowed with his own heraldic arms. Dawnbreak main activities include both husbandry, mostly of horses, and inland trade, as the settlement itself was founded as a stop in the road between Firsthold and Skywatch. There was a time when Dawnbreak was a minor mining town, but the tunnels were all abandoned by the mid-Second Era. The nearby Isle of Contemplation is commonly used as a place to meditate or to have an outdoor meal with friends and family during the day, but it is also known to be sometimes used as place of secret sexual encounters under the moonlight.